Well Hello everyone! Isnt it a beautiful day?!? I have just been so busy around here and just loving it. 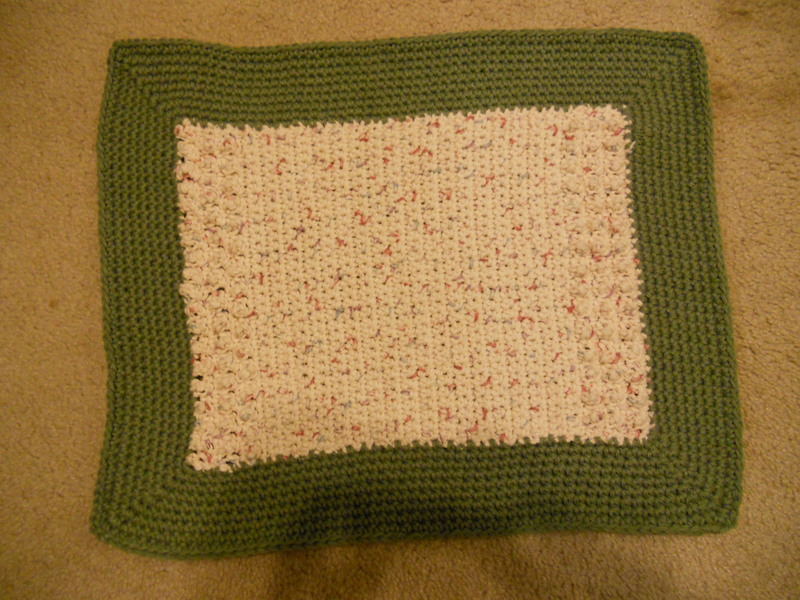 I have been working on this Bath Mat for several days and Im going to give you the pattern. I tried it out last night for the first time and it worked great! It needs to be washed and blocked to make it look right but it is really pretty. Finished size: Approximately 16 X 20″. Im going to make another one for my husbands bathroom. Im just sure he will love it. So here is the pattern. Use 2 contrasting cotton color yarns. I used a cone of each color and didnt use all of either color. If that helps. Stitches used: ch (chain), sc (single crochet), tre (treble crochet). Row 1: ch 44, sc in 2nd ch from hook and in each ch across, ch 1, turn. Row 2: *sc in first sc, tre in next sc*, repeat from * across, ch 1, turn. Row 3: sc in each stitch across, ch 1, turn. Rows 4-7: Repeat rows 2 & 3 twice. Row 8 – 52: sc in ea sc across, ch1, turn. Row 53-60: repeat rows 2 & 3 three times, fasten off. Border: Using contrasting color slip stitch to any corner. Round 1: sc 3 times in corner, sc in each stitch across to next corner, sc 3 times in that corner, work sc in spaces along edge to next corner, sc 3 times in corner, sc in each stitch across, sc 3 times in corner, work sc in spaces along edge to next corner, sl st to first sc made, ch 1. Rounds 2-10: sc 3 times in middle sc of 3 sc group, sc in ea sc across, sc in middle sc of 3 sc group, sc in each sc across, sc in middle sc of 3 sc group, sc in each sc across, sc in middle of 3 sc group, sc across, sl st to first sc made, ch 1. At the end of row 10 fasten off or if you prefer a bigger border then just keep on going. If you have any problems with it please feel free to email me or leave a comment here on this site. I will respond as quickly as I can. Ya’ll take care and have a beautiful day! And as always, May your handswork be blessed and your felting fulfilling!